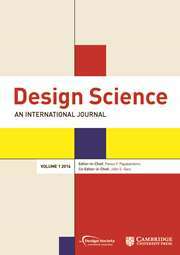 Design Science is an international open access journal publishing original quantitative and qualitative research in the creation of artifacts and systems, and their embedding in our physical, virtual, psychological, economic, and social environment. Peer reviewed by an international editorial board, Design Science aims to serve as the archival venue of science-based design knowledge across multiple disciplines. The Journal will facilitate communication across diverse fields and will serve as a bridge across several communities, publishing original research with a strong emphasis on accessibility by scholars from a diversity of disciplines. Thematic Collection seeks to contain high quality and novel contributions reporting on how design research relates to design practice. Contributions reporting on how research findings have impacted design in practical situations and how design practice has motivated design research are particularly welcome. Click through to read the full details of this call for papers.